Two fighters enter the ring; one comes out. 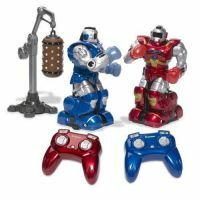 Now you can be in control of the action with our Boxing Fighter Robots; move in 8 different directions and throw four types of punches in battle mode at your opponent's robot with the included remote controllers. When they get into a match, there's no stopping them - lights flash in their gloves, Sock n' Roll music blares, and the cheering gets ever more enthusiastic! Gloves and eyes light up; the speakers play music, cheers, and the robot's fighting sounds!